Increasing emphasis on genetic research means that growing numbers of human research projects in Australia will involve complex issues related to genetic privacy, familial information and genetic epidemiology. The Office of Population Health Genomics (Department of Health, Western Australia) hosted an interactive workshop to explore the ethical issues involved in the disclosure of genetic information, where researchers and members of human research ethics committees (HRECs) were asked to consider several case studies from an ethical perspective. Workshop participants used a variety of approaches to examine the complex ethical issues encountered, but did not consistently refer to the values and principles outlined in the National Statement on Ethical Conduct in Human Research (NHMRC 2007) or apply rational ethical approaches. 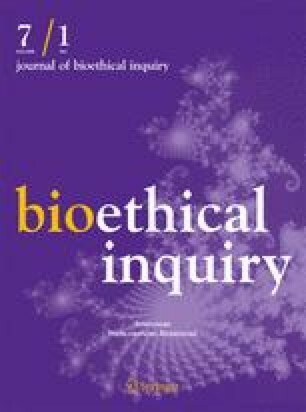 Overall, the data suggested that both researchers and HREC members may benefit from further education and support regarding the application of ethical frameworks to the issues encountered in genetic research. NHMRC. 2007. National statement on ethical conduct in human research. In http://www.nhmrc.gov.au/publications/synopses/_files/e72.pdf. NHMRC. 2008. Disclosure of genetic information to a patient’s genetic relatives under Section 95AA of the Privacy Act 1988 (Cth): Guidelines for health practitioners in the private sector. Consultation Draft. http://www.nhmrc.gov.au/guidelines/_files/Draft_Guidelines_%20Disclosure_of_genetic_info.pdf. NHS. 2007. National Research Ethics Service: Training for RECs. Available from http://www.nres.npsa.nhs.uk/rec-community/training-for-recs/ (cited 29 August 2008).